For beginners or those who prefer a more leisurely approach to angling, or those who just wish to try their hand at catching a few fish within walking distance of their accommodation, then Donegal Thatched Cottages offers a perfect base, and Cruit Island offers excellent possibilities. Below we give details of a number of these possibilities and take you from A to Z on the basis that you are just a beginner. We trust you find this helpful and wish you luck with your fishing. “Beir bua”. As with walking, Cruit Island is a real angler’s paradise, offering exciting possibilities for spinning from the rocks, beach casting and wrasse fishing . In many cases this will involve traversing across privately owned lands. We, at Donegal Thatched Cottages, make no claim whatsoever to those lands nor do we seek to establish any rights over them. Anglers who choose to fish on Cruit Island do so of their own free will, at their own risk, and at the discretion of the various landowners, who together with Donegal Thatched Cottages, accept no liability for any injury sustained in the process. For your own sake we ask that you take every precaution and treat the sea with due respect. Never allow children to fish unsupervised. 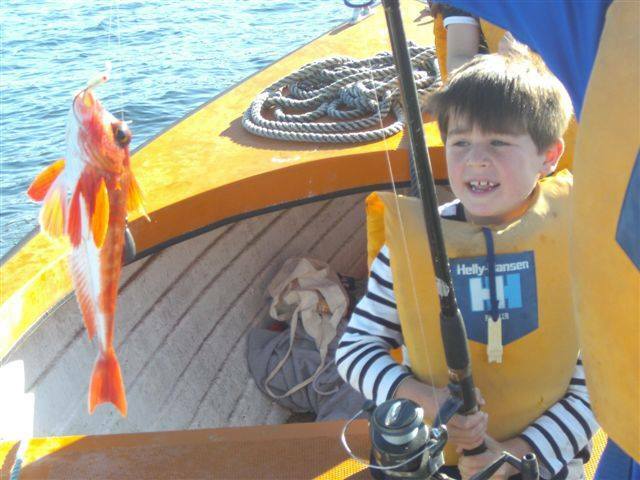 There is also excellent deep-sea angling out of Burtonport about five miles away, and even more locally at Kincasslagh Pier just across the bay from the cottages, while the Rosses Fishery offers game angling at any one of 130 small lakes within a five mile radius of Dungloe. Cruit Island offers really exciting possibilities for wrasse fishing, including the opportunity to catch specimen wrasse from the dozens of deep inlets and flat ledges scattered along the west side of the island…….all within walking distance of your thatched cottage. A big part of the excitement and fun is seeking out and finding the hot spots for yourself in the knowledge that they are only rarely fished and some indeed may never have been fished. I am not therefore going to spoil your fun and point you in any particular direction. Look out for safe flat ledges over deep water where there are lots of tiny blue/black mussels attached to the rocks, a good scattering of cone shaped limpets attached to the rocks and often seaweed. This is quite a dangerous type of fishing as some of the perches can be precarious and there is always the possibility of either slipping or being swept in by a freak wave……..so be very careful. The wrasse come in on the incoming tide to feed off these tiny mussels. They have a mouthful of teeth which also enables them to pluck cone-shaped limpets from the rocks…….no mean feat. Wrasse are a beautiful looking fish with various shades of red, blue and black, depending on the underwater habitat where they feed. Be careful however of the sharp spines in the dorsal fin on their back. A prick from these can be quite painful. Although they look beautiful, wrasse are rather coarse and bony and make only moderately good eating. The real sport is in catching them ! Salted wrasse, known locally as “bion”, used to make up the staple winter diet of many locals before the days of refrigeration. 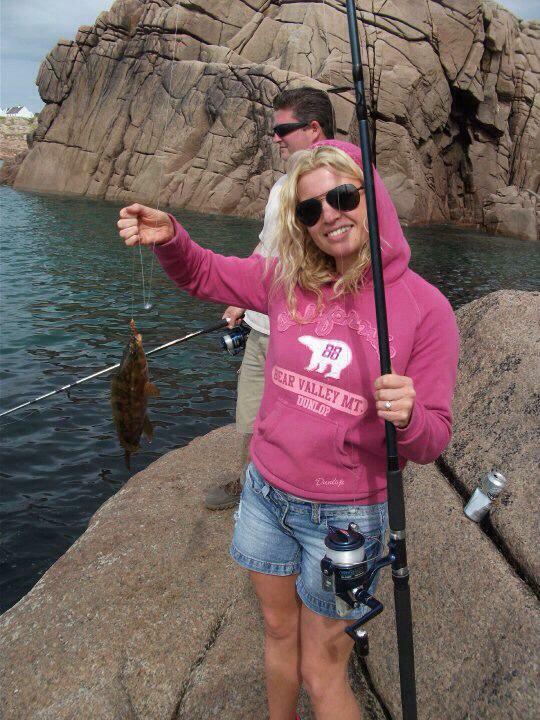 Wrasse can be fished all year round but the best times are May to September. Incoming tide is best. You will need a reasonably long rod, a reel with strong nylon line and a hook at the end, a float, a small lead bullet weight and a plentiful supply of bait. 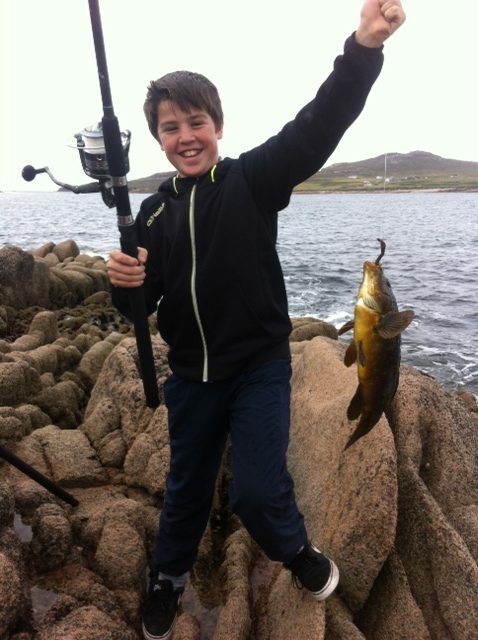 If you have not already got the equipment you can buy it at Bonner’s fishing tackle shop in Dungloe, indicating that you are interested in wrasse fishing. The float should be arranged so that the bait is dangling about a foot from the bottom. This will depend of course on the depth of the water. More experienced anglers may prefer to use no float and allow the bait to drop to the bottom. For bait you can use either lugworm, soft-back crab or limpet. I prefer lugworm. You can find them in their thousands at the bridge leading onto Cruit Island. Look for the little mounds of sand that have passed through their system and now look like a tiny decorated bun. In each case you will see a breathing hole about 6/9 inches ( 20cms ) from the mound. Dig half way between the two, taking care not to cut through the lugworm and bearing in mind that some may get away. When you have baited your hook with the lugworm cast out about 5/10 metres and allow your line to gradually float back in towards the rocks, watching your float at all times. Now sit back, breathe in the fresh air, read a book, eat a sandwich but keep a wary eye at all times on your float. First you will see it bob below the surface once or twice in quick succession, then it will plunge deep below the surface. That is the time to strike!! Good luck. Beir bua. 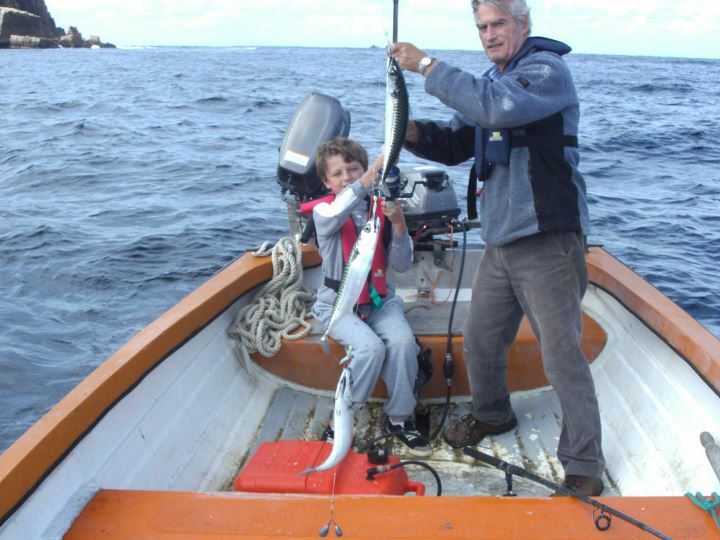 Mackerel and pollock can both be caught right on-site at Donegal Thatched Cottages !! In the case of mackerel from the large flat ledge behind cottage number 5 ( N.B. if the ledge is wet it becomes very slippery and dangerous ) In the case of pollock from the craggy rocks down from cottage number 3 where you may also spin for mackerel. However a better place is probably just to the right of the slipway down from the Golf Clubhouse at the end of Cruit Island or from the flat ledge well over to the right from there, beyond the Light Beacon. Another good spot is the flat ledge facing Seagull Island just before you come to the very large house towards the end of Cruit Island. All of these are within easy striking distance of the cottages. Both mackerel and pollock are highly edible, mackerel being oily but extremely tasty and pollock somewhat drier and more bland. Remember that pollock are the ones with the big eyes while mackerel are a beautiful blue/black fish. In each case you will need a spinning rod, a spinning reel, light to medium nylon, a swivel, a lead weight and a trace of artificial lures or feathers. Alternatively you could forego the weight and feathers and choose to use a single heavy artificial bait such as a German sprat. All of above can be purchased in Bonner’s fishing tackle shop in Dungloe. Be sure to specify that you intend to fish for mackerel and pollock and ask them to show you how to set up your new tackle…….especially the placement of the swivel and the lead weight. Without a swivel you will just end in constant tangles. If you do not know how to cast out with a spinning rod/reel be sure to ask ! For this type of fishing you do not need any live bait as the artificial lures are sufficient. Make sure there is nobody behind you when casting out. Hold the nylon line with the crook of your right forefinger. Push over the bar of the reel with your left hand. Now cast out the line taking care to release your right forefinger just as the rod is straight out. If you are new to the technique it will take a little time to perfect it.!! Now wind in your line by slowly twisting the handle of your reel. Mackerel feed towards the mid to top of the water so you reel in faster if it is mackeral you are after, while pollock feed towards the bottom so you reel in more slowly for them, allowing your lures to drop towards the bottom but taking care not to get snagged by seaweed on the bottom……sometimes easier said than done !! How will you know if you have caught a fish ?? Mark my words : you will know !!. There will be a lively, vibrating, ongoing tug on the end of your line, totally different to the dull dead pull when you snag a rock or some seaweed. Good luck. Beir bua. The sandy beaches all around Donegal Thatched Cottages offer exciting possibilities for bottom fishing for flounder, dab and dogfish with the prospect for experienced anglers of ray and skate. On one occasion a few years ago I saw an experienced angler catch 43 dogfish from Tra Dhearg beach directly adjoining the cottages. However he was night fishing, which is best for bottom fishing, but which is just a bit too much like hard work for mere mortals like you and me. For more casual family fun I suggest either the flat ledge behind cottage number 5 ( dangerously slippery when wet ), Tra Dearg beach below cottage number six or the sandy reaches of Kincasslagh Bay from the rocky headland a few hundred metres to the right of the slipway and accessed from further back the main Cruit road through the pedestrian right-of-way. This last is probably the best for flounder. Remember that flounder and dab are flatfish, quite like plaice, but without the spots. They are highly edible with their own distinctive seafood taste. Dogfish on the other hand are members of the shark family with skin rather like sandpaper and capable of scraping an unsuspecting angler. Although both commercial fishermen and anglers used to place very little regard on them they have now come to be highly prized and have mostly replaced cod as the “fish” element of “fish and chips”. The spinning rod and reel as described in “spinning for mackerel and pollock” are quite O.K. for this kind of bottom fishing although purists would probably prefer a long beach-casting rod and a multiplier reel. Nylon line should be light to medium. You will also need a medium bullet lead weight, sufficient to cast out the line, a swivel with a 3 foot lead to a silver spoon, and a shorter sinker to a hook baited with lugworm. For details of where to find lugworm see “wrasse fishing”. Cast the bait out as far as possible as described in “spinning for mackerel and pollock”. Leave till it drops to the sandy bottom, then slowly reel in for about three turns of the reel. This causes the spoon to kick up sand and draws the attention of fish to the lugworm. Leave for a few moments and then repeat this action a number of times until it is time to cast out again. When you feel the first bite from the fish do not strike but wait until the fish is hooked before striking. This type of fishing can be practiced all year round with September the best month. Good luck. Beir bua. Game angling is a freshwater sport and consists of fishing for salmon, trout or sea-trout. This type of fishing requires the purchase of a licence and in the case of a privately operated fishery also requires the purchase of a permit from the local fishery. The Rosses Fishery is a Dungloe based fishery which controls the fishing rights to about 130 small lakes within a five mile radius of Dungloe, plus a number of salmon rivers. All of these are within easy reach of Donegal Thatched Cottages. Here you can fish for small wild brown trout, good sized stocked rainbow trout, wild sea-trout and the occasional salmon. The fishing is fly-fishing only. This is a highly skilled sport more fitted to those with some experience in casting a fly, rather than a raw beginner. The purchase of a licence and permit, plus the rental of a lake boat can be arranged with Bonner’s fishing tackle shop in Dungloe. Fishing season is February to September, with September the best month. The Rosses Fishery organise many fishing competitions during the year with excellent prizes on offer. Overall the Rosses Fishery offers excellent game angling at a fraction of the cost in some of the more highly acclaimed fisheries. Deep sea angling is not for the faint hearted or those who have only a mild passing interest in fishing. Indeed if you are a beginner there is a good chance that you may get sea-sick when the captain cuts the engines and the boat starts to roll with the swell. However for the real fishing enthusiast nothing quite compares to a full six hours of dedicated fishing in waters that could yield any one of more than a dozen exciting species. Out there in the deep you will forget every problem you ever had as you become “man the hunter”once again and your entire energies are focused on the excitement of the hunt. Although expert anglers will always catch more than a raw beginner, nevertheless even beginners have an excellent chance of catching good sized fish from a deep sea charter boat, especially if the skipper knows his stuff and places you over good fishing grounds. Burtonport, only five miles from the Donegal Thatched Cottages, is a commercial fishing port and also a centre for deep sea angling. Here Neil Gallagher, a highly experienced angler, skippers the 43 foot purpose built Aqua Star, which is available for charter from May to October. You can bring your own fishing tackle or rent it from Neil. The Aqua Star is also available for charter by Scuba Divers. Full details at www.donegalseaangling.com. A brand new purpose built sea angling boat now operates out of Kincasslagh Pier, just minutes across the bay from the cottages. She is skippered by Paul Mc Gonagle who has an in-depth knowledge of the waters around Owey Island. This is a wonderful facility right on your door step. If the tides are right he will even pick you up from Iomaire Bui, just across the road from cottage no. 10. Paul also does sight-seeing trips in the stunningly beautiful waters of Kincasslagh Bay and surrounding areas. He also offers the added advantage that he operates short trips of a couple of hours. Highly recommended. Telephone 087-9870266. Full details at www.saoiremara.com.